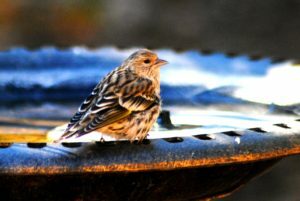 Signaling the arrival of winter, Pine Siskins are a “winter finch” that live in the pine forests of Canada during the summer months and migrate south during the winter in search of pinecones, seeds and berries. Well, they arrived in droves at our house in New Mexico this month! 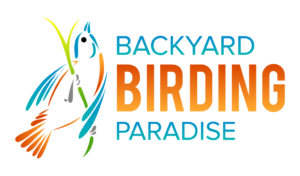 These gorgeous birds are easily spotted in our backyard clinging to the ends of conifer branches, even upside down, to feed at cones. This year we have one in particular that is larger than the rest of them. After a little online research I learned that these birds have a tendency to become considerably more plump through accumulation of fat with the onset of winter temperatures. Did you know? Each bird can pack enough seeds into its expandable esophagus to sustain itself for an extra five hours overnight, especially when temperatures are below zero degrees. (Yeah, I found this little tidbit difficult to swallow too. Lol). 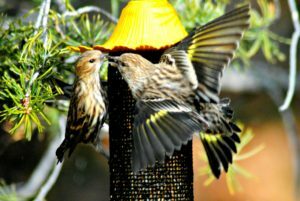 Pine Siskins prefer coniferous or mixed coniferous and deciduous forests with open canopies (which explains why they like our place!) and they are opportunistic and adaptable in their search for food. They’ll forage in weedy fields, scrubby thickets, or backyards and gardens. 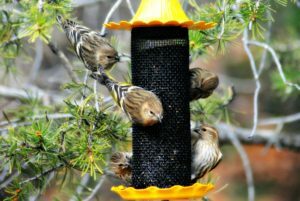 They’ll also flock around feeders, especially thistle feeders, in woodlands and suburbs. Pine Siskins are one of my favorite birds to watch, and especially because they spread their wings wide to intimidate other siskins at feeders. 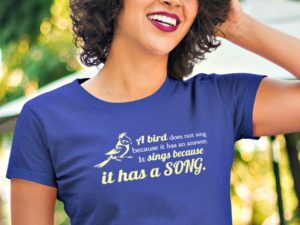 They don’t realize this, but in doing so, they show off beautiful subtle yellow edgings on their wings and tails. It’s just gorgeous to see.